<smallJerry Wade of CTM Labeling Systems was interviewed for an Amazon video blog. A major supplier of automated labeling equipment for Amazon’s Fulfillment Centers, CTM was featured by the company to highlight the suppliers Amazon works with. CTM Labeling Systems was featured recently in an Amazon community video for supplying the majority of printing labelers for Amazon’s Fulfillment Centers. 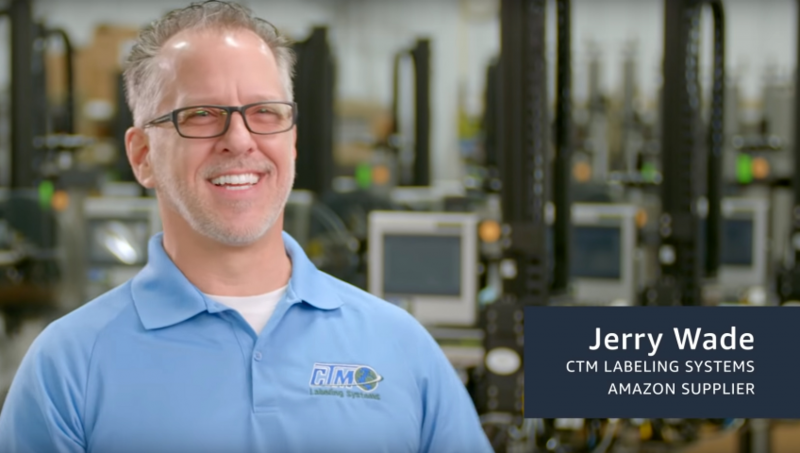 March 28, 2019 (SALEM, Ohio): CTM Labeling Systems, a leading US supplier of world-class labeling systems, was showcased last month in a video blog published by Amazon, the iconic online retailer. The video and accompanying blog included interviews with CTM management, as well as video footage of CTM’s production processes and downtown Salem, Ohio where the company is based. Read our blog about Amazon’s visit here. View the press release on Yahoo Finance and Digital Journal. Based in Salem, Ohio, CTM Labeling Systems is a major manufacturer and supplier of world-class labeling systems. All of the company’s labeling systems, applicators, and printers are made on site in the USA.